They made the 5,900 kilometer trek from Montreal to Barcelona with one goal: to follow in the footsteps of their Barça idols by participating in the 2018 FCBEscola International Tournament, which this year is bringing together some 1,900 kids from around the world to compete over four days in the Barça Academy's marquee annual event. 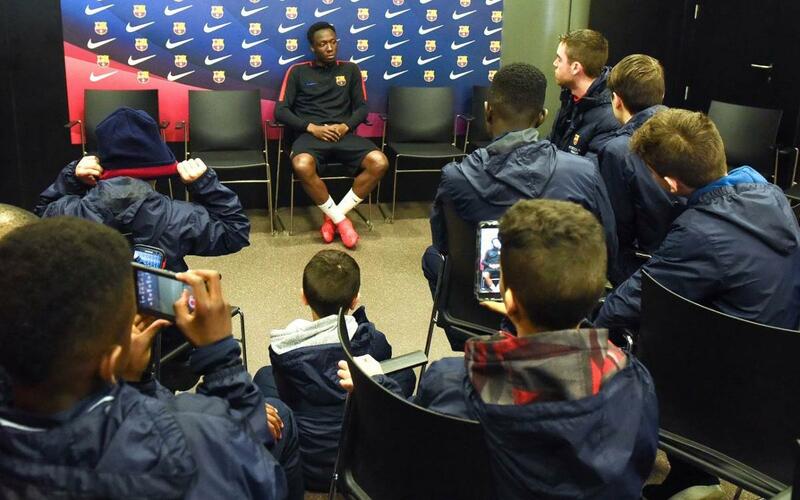 But before Tournament opens on Monday, the children representing the FC Barcelona soccer academy in Quebec got the chance to attend a Barça B training session, where a young man named Ballou Tabla is currently turning heads. Ballou, an 19-year-old winger who was born in the Ivory Coast but moved to Canada as a child, joined FC Barcelona last summer from the Montreal Impact. After the reserve team worked out, the budding young players from the FCBEscola Montreal got to meet Ballou. Here are the highlights of what Ballou had to say. “I’m working hard to get used to playing under pressure and keeping possession."